This was in our local Caspar Star Tribune yesterday. Sorry for the bad quality but I had to take a pic with my phone. At the moment I just want to hear some comments from you guys. 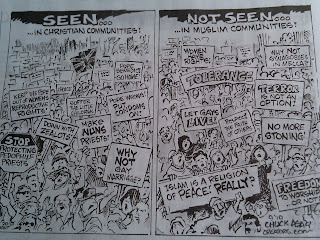 See what you think as to whether this is an accurate representation of both religious communities or not. My short answer? Yes....and NO. btw I forgot to note the artists name and now its rather hard to see down there but Im sure someone can make it out who has better vision than I do. Now will look more carefully at the cartooon itself. Chuck is obviously a moron. Who obviously is really into hating on muslims, and is really into gay marriage. I'd say it's accurate to an extent. On the Christian side, there are many who are for women's rights and against the Catholic church... and they express those views whenever they get the chance. Don't know much about the Muslim side other than to say, there may not be as much protesting against their own religion/culture out in the open perhaps. Chuck must not listen to the same media sources as I do. I am constantly listening to programs on women's rights movements in Islam. I have heard countless Muslims speak out against terrorism. As for respecting the faith of others and tolerance, the controversial mosque in New York was supposed to be an interfaith community center. As for gays, I personally think it's a sin, but not punishable by death. I have heard just recently many Muslims making a case for it NOT being a sin. No more stoning, well, I'm all for being against stoning and I think most Muslims probably are. Saudi Arabia is not Islam incarnate. Also, stoning comes from hadith, not the Qur'an so I throw it out the window. I just posted about my lack of faith in hadith a minute ago. And why not synagogues in Mecca? Really? That's just absurd. We're trying to build a mosque "near" ground zero, NOT at the site of Jesus' presumed tomb. That'd be a more comparable comparison to the synagogues, or lack thereof, in Mecca. Of course, after going through and counterarguing all of his points, I do have to (sadly) admit that not all Muslims are united on all of these fronts. Too many Muslims are still looking to the wrong sources/examples of what Islam is and isn't instead of searching in the Qur'an. If you model your Islam off of the govn't of Saudi Arabia, or the rantings of terrorist recruiters online, then perhaps you deserve this cartoon. Two people loving each other is a sin to you, huh? So glad I don't belong to your twisted "religion". @ anon - you must not belong to Christianity or Judaism either then because they also believe homosexuality to be a sin. It's absolutely fine for you not to agree with me but don't act like this is specific to only one religion. It was actually Christianity which taught me this (I was a Christian for 22 years). I have only been a Muslim for just over a year. Most of my Christian beliefs easily carried over, minus the deity of Christ, of course. I have gay friends and it's a tough issue to reconcile. In the end I do believe got created man and woman for one another, though, not man and man or woman and woman. I don't expect you to agree with me, just stating my case. Um...no I'm not a Christian or a Jew either, so don't assume that I'm doing some random Islam-bashing. I feel the same way about all Abrahamic religions - in fact, I have no religion. I prefer those pesky little things like facts and reason. And I hate to tell you this, but you DON'T have gay friends. It's revolting that you use some gay people you have met in your life as some kind of palliative to your bigotry. I mean, it's funny because I didn't think bigots still used the "I have ____ friends" argument. It's so transparent. You say "God" created man and woman for one another. I say prove it. With proper, empirical evidence. I'm really tired of this bull**** idea that Muslims do not defend human rights or condemn terrorism or all of that - WE DO. Not all of us but many of us - enough to represent a sizable amount. The question is: do people prefer to listen to that or do they prefer to keep thinking that Muslims are intolerant backwards people, a view that is essential to their racist understanding of the world? Why is Reza Aslan never on the news, whereas Bin Laden and Hirsi Ali always are? Besides, if we wanna push this, why should Muslims CONDEMN or EXPLAIN terrorism - when it has NOTHING to do with most of us? I'm not a terrorist so why should I explain it? I don't ask white Americans to explain or condemn the KKK. Well, I am Muslim and just this week I had a long argument on my blog with someone who said Islam=terrorism and while I disagreed with him I did say that there is violence in the Quran but that it is time-bound. It happened. Shouldn't happen now. Period. I am against stoning. For tolerance. Against terror. For women's progress. I think gays should be left alone. Does that make me a Christian according to Chuck? 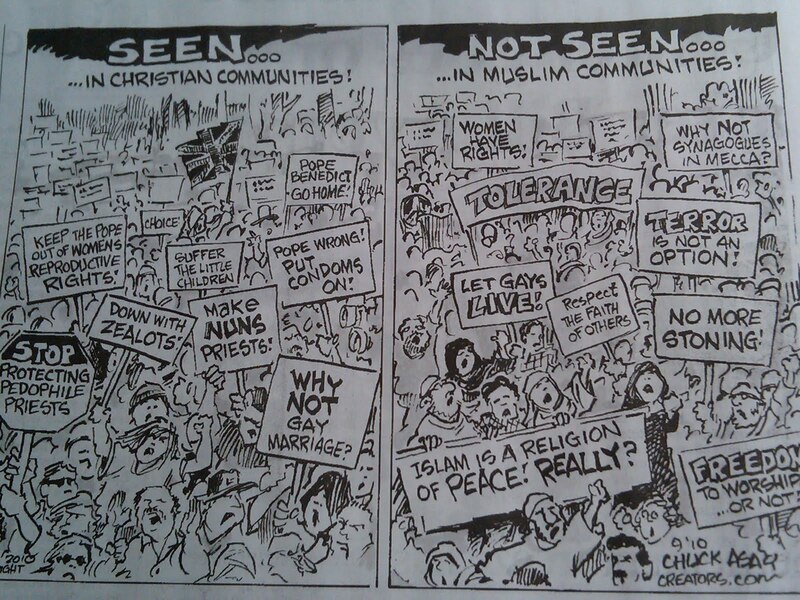 My take on this is that ALL Christians are not fighting the "good" fight as indicated in this cartoon. Quite alot of them are happy to just keep minorities down...send gays to hell..and all non Christians must bow before God who happens to rule American govt (apparently). On the other hand, I have yet to see a mob/riot/protest etc that is anything like what the Muslim cartoon depicts when it comes to Muslims. Individuals might be against those actions...but they dont go out and protest about it for sure. So in some small way he is correct. but thats just my take. There is no central governing body in Islam that would rival in power that of the Catholic Church (Not even top Shi3a clerics). If you go out and protest against "terrorism" who exactly are you facing? Theologically speaking, there is absolutely no Islamic governing body to which any Muslim is religiously bound. How about if Muslims around the world organize protests all on the same day where they burn effigies of Bin Laden and some of these other hate mongering 'sheikhs'? They can wave placards and banners with peaceful quotes from the Quran? Would that ever happen? That's what I am waiting to see. islam is a religion of peace?.. 1) They destroyed Vietnam and killed millions. 4) millions Dead in world war by them. old Testament and still murdering Palestinian children and bombing hospitals there. To answer your question: yes, I think it's pretty close. I think the biggest difference, is not the religion of the protesters, but the governments. Muslim majority countries often preclude demonstration by its citizens, and high risks if they do. So it may be religious satire but it is misplaced. The cartoon is accurate, painfully so. It demonstrates why Islamic societies are unable to have, much less understand, the concept of freedom (speech, religion, etc..) or even link the lack of those basic freedoms to consequences in other spheres in life (political, law, marriage, and so on). Muslims cannot, will not criticize Islam. They may at most say that some so-called misguided Muslims do bad things, but that is it. To suggest that the evils that exist in Islamic societies or in the actions of Muslims come directly from Islamic theology and teachings is beyond the capability or courage of any Muslim. To hold this position they throw logic out the door and establish a strange set of standards which they then apply selectively, but that doesn't bother them much. All a Muslim has to do is claim some barbaric or unjust practice is islamic and Muslims back off at a speed approaching that of light. The other side of the coin are the hadith: If Mohammed did it, it is really not bad depending on the circumstances. These two simple rules squash all dissent and end discussion. So nothing changes. Anything goes. The issue then for Muslims is who to blame. Some blame those darn infidels, particularly the evil jews, some blame governments, some blame racism, but I blame bugs bunny. Pick your evil person of the day, but never blame Islam. As I have said before, Muslims are incapable of self-reflection when the issue is their religion. In a way, this does make sense, however. Monica, Muslims are "religiously bound" to the Quran, hadith and Mohammed. Surror, where exactly does the Quran say that it is "time bound"? Must have missed it! No. Anon, Islam is only to blame for its own sins (and there are plenty staring 1400 years ago), not those of others. Does that answer your question? Let me put this is simple terms, if one cannot talk about bad, evil things, one cannot change them. That is the message of the cartoon.